Call it the Van Diemen's Land effect. After years of up-and-coming Australian directors using well-trodden territory such as horror, revenge or supernatural movies to make their first independent splashes into the global film pool, we're now seeing a rash of new filmmakers delving back into the nation's bloody past to make their debuts. Van Diemen's Land -- with it's true to life tale of bloody cannibalism in the harsh unforgiving wilderness of early 1800s Australia -- was a start, and a few weeks ago we added Moonlite (an unorthodox tale about the outlaws that stole from the mail coaches and banks during colonial Australia) to the list. 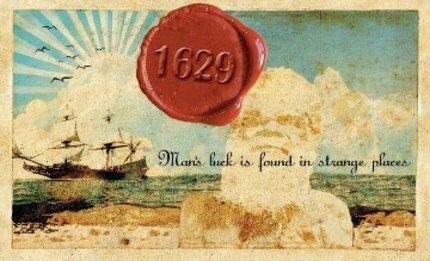 Now we can add 1629 -- finally a story of the bloody Batavia shipwreck and aftermath -- directed by Nathan Christoffel who made a startling indie debut with his no budget Brazil-esque Eraser Children and produced by Andrew Scarano, who was the driving force behind Into The Shadows, a fantastic documentary made about the demise of independent cinemas in Australia. Both films were jointly awarded best Australian film at the controversial Melbourne Underground Film Festival last year. Based on true events, in 1629 the Dutch trading vessel 'The Batavia' landed on the coast of Western Australia. Finding nothing of great value the ship set sail for Indonesia but ran aground 70 miles out to sea, sinking near the Houtman Abrolhos Island. A massacre by the ship's own crew of 120 men, woman and children had ensued, led by mutineer Jeronimus Cornelisz. As punishment for their horrible crimes the two youngest offenders, Wouters Loss (24) and Jan Pelgrom (17), were left marooned on the Western Australian coastline. They are given a small boat and some supplies and step onto the beach as the first white men to live in Australia. 1629 follows their amazing Journey as they live within an Aboriginal tribe, giving up their European life for a culture like none other. We don't have any video from the film yet but check out a trailer for Nathan's debut feature Eraser Children below. There's also the teaser poster/postcard above.